Preschool Playbook: And We're Off! The Pre-K class had their first day today. It is so fun to see these little ones again. I am always present as director on this day. There I am in my skirt, heels, nice shirt, and even jewelry. The little ones come in and have to look twice before they even know it's me. You see, my normal wardrobe is pants, shirt, and sneakers--hardly ever jewelry--not even earrings. When they know it's me they just light up--hugs all around--one of the best days. On the opposite side of the spectrum, last night was our meet the teacher night for the three year olds. Want to come home with a complex? Meet 24 little three year olds and watch their faces. I know it's like this every year. A couple of weeks and they will be my best friends. Today I got to get hugs all around, followed by the "parent meeting." Sometimes I wonder how I ever got this job. I went into teaching preschool because I can work well with 3, 4, and 5 year olds, but parents terrify me. Honestly, I have never had a horrifying experience with a parent, but I just get so nervous. Even though it went very well. Although, I'll be hoarse in a couple of days. Happens every year. By the second week of school, I can't talk for a week. I wanted to share with you the little project the Pre-K teacher did with the children while I was in the meeting. Many of you have probably seen this before, but the reaction from the children was so genuinely one of awe, that I thought I would share it. I came up to the room with all the parents, and you would have thought the teacher put on a magic show for them while we were gone. 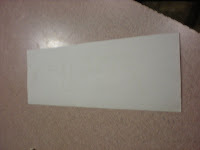 All the children got a piece of white paper that looked like it had nothing on it. In truth she had written the children's names on the papers with white crayon. She then had watercolor paint out for them and allowed them to paint the paper--their name appeared. Total amazement. If you've never done this with your little one, give it a try I'm sure it will go over well. The Pre-K is on their way. My class has the parent meeting on Tuesday and then the big good-bye on Thursday. So, we're ready to go and full of excitement. Hope your school time is going well too. Wow, you could've been talking about me! I, too, have a much harder time with the parents than I do the children. We had our open house and parent night this week. I was SO glad when they were over. This is my 11th or 12th back to school (I've lost count) and it never gets easier. I just want to be with the children! We start on Monday. I've tried getting my daughter to draw with wax and then to paint but she's more interested in the painting part, I never thought of doing the resist for her with a white crayon first. I'm doing a play date/ sitting while my friend goes to work session with a toddler, a preschooler and my daughter in a few weeks. They expect arts and crafts extravaganza's from my sitting time with them and this project will totally make our afternoon a treat! I like putting the secret message on first. Cute idea! ps. Now that I have my appetite back, it seems as though my posting have a food theme. He, he! Banana snacks- today is chocolate play dough! great idea! thanks for your creativity! "A Few of My Favorite Things...."
Productive Parenting: A Wonderful Site!